Getting to know more about the foreclosure laws in Washington is important for every homeowner who is under the contract of a mortgage loan. Learning more about foreclosures in this state can help homeowners to understand the process and possibly help them to avoid this kind of procedure in the future. In every state in the country, there are specific rulings on foreclosure laws. In this article, we are going to summarize some quick facts about the foreclosure process in the state of Washington. This information can help you make sound decisions if you ever face the possibility of foreclosure. Washington’s foreclosure process has 2 options: The judicial process and the non-judicial process. The typical timeline for a completed foreclosure process is 120 days. The primary instruments used for securing a foreclosure are the deed of trust and/or the defaulted mortgage loan. The distressed homeowner can proceed with a Right of Redemption for their home within 11 days before auction sale; Redemption of Notice however, is not available if foreclosure was done by a non-judicial process. Under the judicial foreclosure process, deficiency judgement can be used to sue the borrower. However, this is not possible if the borrower has already vacated the house for six (6) months before the foreclosure notice. In addition, the borrower cannot be sued for deficiency judgement if the foreclosure was done using the non-judicial process. This is done when there was no Power of Sale attached to the borrower’s Mortgage Contract or their Deed of Trust. A judicial process involves the lender filing a complaint or a lawsuit in the local court, so that the foreclosure process can begin. Once the foreclosure has been granted, the said property can now be auctioned by the lender for the highest bidder in the market. Non-Judicial Foreclosure process is used when there is a Power of Sale attached to the borrower’s Mortgage Contract or their Deed of Trust. As stated on their Power of Sale, wherein the buyer is giving the lender the right to sell their property in the event of default. The lender can now outrightly sell the mortgaged house without requesting it from a local court. This is now called the non-judicial foreclosure process. A written foreclosure notice should be given to the borrower 30 days prior to selling their property under auction. This is to give way for the borrower to find ways to work with the lender regarding their defaulted property mortgage. This can be done in any of the following ways: Registered mail, first class mail, return receipt request or by placing the foreclosure notice on the house itself. 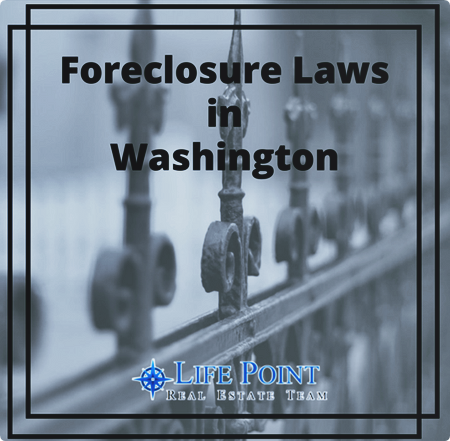 Having a fair amount of knowledge about the foreclosure laws in Washington can give homeowners ample time to become prepared and educated about the laws in this specific state. To learn more, visit our blog section for more helpful topics regarding real estate in the state of Washington. …or, are you ready to start your home search? Start with our free resource!